If you need some inspiration for your own wish list or if you are looking for a presents for a woman in her early twenties, here are a few of my wishes. The one thing I have always wanted, but never had in my life. My parents never had a microwave and therefore I never had one and I have been wanting my parents to get one for so many years, but now that I live alone, I have the chance to get one for myself, so this item went on my wish list. These simple necklaces just look great with everything and this one from Jane Kønig is just beautiful, I want mine with the letter R.
Coffee has now really become a thing in my life, I can appreciate and enjoy and since french press coffee is some of the best, I gotta try it! I don't have a real coffee maker, where I can make coffee for more than one person at once, I thought this would be perfect for that, and it's really easy to use as well. The most inexpensive lens you can get for your canon camera. I have been wanting this since last year, since I only have the original lens my canon camera came with and I have heard this lens creates beautiful photos and I would love it for taking blog photos. I have heard so many people talking about this product and they all love it. I normally use the cleansing balm version of this product, but I would like to give the oil a go, when I'm removing my makeup. About half a year ago I bought an open card holder for six cards from eBay. It was really cheap and it's not made of real leather. This card holder folds in half and has room for eight cards, which is perfect for me, it's black and it's made of real leather, so this would last for years. I love these small "wallets" because they fit in all my bags and purses, so if I'm going out with a small clutch or purse, I can easily throw this in. This is one of the items I never bought when I moved out, so I went online and found these see through grinders with silver details and I just think they look really nice and I love that you can see the salt and pepper through the grinders. I feel like all Danish mothers own these bowls, they are made of sturdy plastic and come in a ton of different sizes. My mom always use these bowls for baking and I just really needed once for the same purpose. This nice well made weekend bag is perfect for when you have to sleep over at some once place or visit someone for a few days. 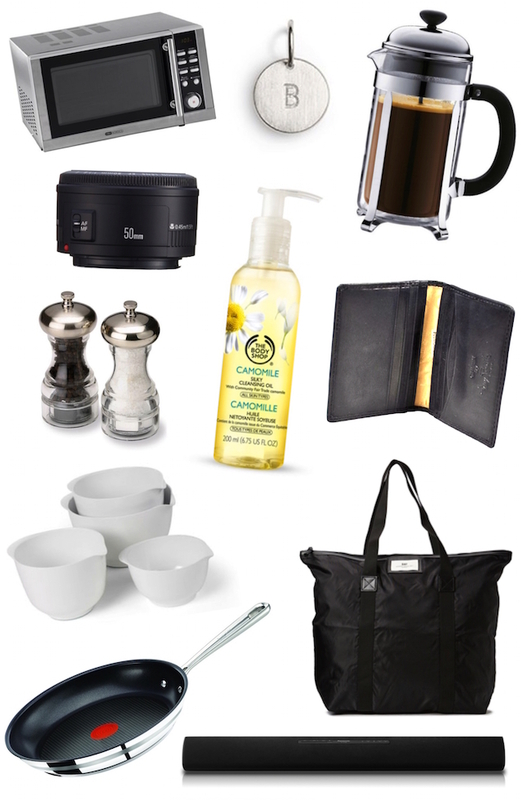 It fits just what you need, clothes, toiletries, makeup and a few other bits and bobs. When I moved out I got some pans and pots from my parents, they didn't use anymore. After a year of using these, I feel like I need some new, fresh pans and pots to do all my cooking with and Tefal pans and pots really work amazingly, nothing get's stuck and they are easy to clean. Earlier this year I bought a new tv. The speakers on this tv aren't the best though and I would like to have an outlet to have the tv sound go through, but also have a music player device, that I wirelessly can connect to my phone to and play music that way.